Blood is thicker than water, they say, and sugar is sweeter than salt. Edax the yellow Wocky stared in wonder at all the stands and booths lining the streets of Neopia Central as his mother pulled him along. It was the Fall Festival, where artisans from all around the world came to sell their goods before Neoschool began. Painters displayed their art on easels, writers read aloud their stories, entertainers juggled and sang and beckoned pets into their grasps, and food vendors eagerly passed out free samples, all hoping to earn a few Neopoints more. Well, Edax had no Neopoints, but he graciously took the free samples, sometimes even two. The young Wocky followed his mother’s gaze to a large, dark wooden caravan that had opened its walls to an array of handcrafted merchandise displayed on shelves built inside. All around it, Neopets in colorful, flowing garbs and flashy jewelry danced and rattled their tambourines. He wasn’t interested. Instead, he wanted to go the other way and visit more food vendors. And with that, she began dragging him towards the caravan. With a heavy groan, Edax gave in and walked, rather grudgingly, alongside her. Instantly, she dropped his hand and rushed up to slide a colorful swatch of cloth onto her hands. She draped it over her arms, watched it scintillate in shades of burgundy and dark umbre in the sunlight. She turned to a red Wocky nearby who batted her eyelashes and smiled at her. Edax, however, was not. Though his mother swooned over the fabric and seemed to forget entirely about him in its presence, his eyes had found something much more alluring than lame old fabric. Sitting near the end of the shelf, at the farthest corner of the wheeled cart, a glass bowl sparkled and shone. But the bowl hadn’t drawn Edax’s eyes: It was the colored candy inside that had. Green ones with blue striations, red ones with orange specks, quite a few of them purple and a small handful, pure black. Each hardened ball of sugar sat wrapped in a thin slip of translucent foil, and the folds in such only further caught the light and set the bowl ablaze with color. And next to the bowl sat a small paper card, folded in half with the words, “Homemade hard candy. Five for 5NP,” written across it in elegant handwriting. But as Edax had realized far too many times that day, he had no Neopoints, and his mother had said he wasn’t allowed anything to eat until dinner. But he wanted one now. He had to have one now. He couldn’t wait—if he waited, they could all be sold and he would never, ever get to taste one. Edax looked around him, then walked casually up to the bowl of candies, acting as if he hadn’t even noticed it at all. He poked at the handspun pots beside it, gazed with disinterested eyes at the hats hung on hooks from the roof, and then rose on his toes and slipped one paw into the bowl as he reached out his other to spin a clear glass crystal that cast rainbows all around him. As he pretended to be entranced with the prism, he carefully unfurled one of the candy wrappers and slowly stowed the perfectly rounded confection between his two foreclaws. He lowered himself until he was standing normally once again and then even more slowly slid his hand back out of the bowl and rested his paw upon the shelf, the candy safely concealed underneath it. Edax looked to his left, glanced to his right, then popped the candy in his mouth. The Wocky whirled around, face to face with a blue Usul that hissed to him as she rose from a crouch at eye level. She scoffed, laughed, and then strode off as if she had never even seen him. Quite startled and shaken, he swallowed the candy and sidled up alongside his mother as she paid the red Wocky a hefty sum of Neopoints for seven meters of their handwoven Noilon. That night at home, Edax colored in his room a bit until his mother called him down for dinner, to which he happily obliged. He clambered into his chair and greedily grabbed his fork as his mother set their plates down and then took a seat herself. Edax ignored her and dug into his spaghetti. One forkful after another, he shoveled the sauce-covered noodles into his mouth, chewed quickly, then swallowed. By the time his plate was empty, his fur was covered in sauce that dripped off his face in large, unflattering globs. “More,” he said flatly and banged his fork on the table. “More please,” he said this time, glaring at her. His mother smiled as best as she could and took his plate to get seconds. When she returned to the table and put the plate before him, she took her seat and stared at the young yellow Wocky. “Well?” the blue Aisha asked. And, once again, Edax dug in without hesitation. “Oh, alright,” she said slowly. Elisha stood up and smoothed the wrinkles from where she’d been sitting. She smiled and bent down to kiss him goodnight on his forehead, then pressed her finger to his nose and made him giggle before she stood up and walked towards the doorway. She cut the lights and pulled the door shut until just a flicker of light would fall inside. She half-smiled, half-sighed, and turned on her way. In the living room, she gathered the Noilon she’d purchased and spread it out on the coffee table. She smoothed her hands over the pattern and began putting pins at the proper marks. She had measured Edax while dinner was cooking, and she wanted to finish the shirt before it got too late. The first day of Neoschool was tomorrow, and even though she couldn’t get him much, she wanted him to still look his best. Setting the pins aside, Elisha grabbed the scissors and began cutting. The Noilon split beautifully, no bare threads at all, and when the cutting was through, she lifted the burgundy and brown fabric and once again admired its craftsmanship. The deep colors would look stunning on Edax. She grabbed her needles and thread and got to work stitching the pieces together. The needle slid through the Noilon like light through glass and the thread became invisible as she pulled each stitch taut. She seamed the edges, sewed on the buttons, and finally added a pocket to the front breast. She smiled at her work, more proud of this than of any other piece she’d strung together, and then set it aside for hanging. Realising she had more scraps left over than she’d expected, she grabbed the needle and thread, made some folds, sewed some stitches, and then at last lifted the headband she’d created. The ruffles and folds sparkled and shone; it would be the perfect compliment for her to wear, and as she tried it on for size, she turned to the clock on the mantelpiece and her heart sank. The headband was perfect, but it had become so late that she might as well call it early. Realising how tired she felt, she yawned and considered taking a nap, but she’d just have to rise and wake Edax soon and then take him to Neoschool, so what was the point? Well, she’d just have to take a nap later then. Regardless, she cleaned up the rest of her work area before she went into the kitchen and cracked some eggs over a pan. She broke the yolks, swirled the mixture around, then sprinkled some cheese over the top and went to wake up Edax. As she sat down on the corner of the bed, she swore it felt a little lower than it had the night before. The Wocky’s eyes quickly popped open and he sat up with a yawn. “Breakfast?” He yawned again. “Okay, Mommy,” he said and rolled out of bed to lumber towards the kitchen after her. As she served her son a third of the omelette, she thought his pajamas looked a bit tight, and as she fed him another third a few minutes later, she began feeling concerned. But as she scrambled up a few more eggs for them to eat, she decided it was just a growth spurt and everything was fine. Edax grinned wildly and ran off. When he returned, she recalled the days they’d gone swimming during the summer and was surprised at how much slenderer he had seemed then. Starting Neoschool, eating more, he truly was growing up so quickly. Edax took the shirt and put his arms through the holes. He fumbled with the buttons, so Elisha stepped in and helped him to close up the front. When they reached the top, though, she narrowed her eyes and frowned. She swore she’d drawn the pattern to be looser than this, but here it was, the shirt was a snug fit. Well, she thought, she’d simply have to run past the caravan later and buy some more Noilon to fix the shirt that evening. But for now, it would do. It didn’t take Elisha long to find the caravan on her way home from dropping off Edax at Neoschool. Even from a distance, seeing all of their extravagant goods set out on display made her eager and excited to browse through everything they offered once again. “As I can see,” the Wocky said and nodded towards the headband that wrapped around Elisha’s hair. The Aisha laughed. Elisha nodded. “That would be lovely, thank you.” When the Wocky made no move to speak, she turned away and began walking around the displays. She saw elegant dresses, golden candelabras, rings and bracelets and beaded scarves in more abundance than she could count. She saw wooden clogs and silk stockings, a Mallard-down pillow and a Dark Faerie Doll unlike the others she’d seen. Then she saw a glass bowl of candies and instantly thought of Edax. It was his first day of Neoschool, she told herself; he deserved a little treat after dinner. With a lighthearted smile, she lifted one of the marble-shaped candies and returned to the Wocky to pay. Hardly a moment later, she was walking away. “Indeed.” The Usul grinned and turned away, allowing the Aisha to pass. Elisha stirred from her sleep to tapping at the door. She sat up and wiped the crusts from her eyes and ran to the hall; through the glass, she saw a black Beekadoodle frantically flapping its wings and striking the windowpane with its beak. Gripped firmly in its claws hung a roll of parchment. How odd, she thought. 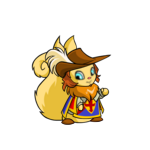 Normally the post was hand delivered, and the Neopian Times typically came vie carrier Weewoo, so it couldn’t be that, and she certainly knew no one who owned a Beekadoodle. And yet, when she opened the door, the bird dropped the parcel and flew off. Elisha bent down to pick it up, and as she straightened herself, she unfurled the parchment. The insignia of the Neopian Central Neoschool was splayed across the top, and beneath it, a handwritten message was sprawled in black ink. “‘Ms. Sacri,’” she read aloud, “‘your son has been involved in an accident...’” She stopped reading, the letter slipping from her hands. Before it could even hit the floor, she flew through the door and into the street. Elisha relaxed a bit as the Kyrii rose from her seat and beckoned her down the hall. The nurse’s office wasn’t too far away, and when they arrived, the receptionist knocked on the door, shared a few soft-spoken words with the nurse who’d answered her, and then stepped to the side for Elisha to pass. “Please don’t be long,” the Kyrii said. The Uni pulled back a curtain and Elisha’s eyes widened and her face contorted at the mere sight of the grotesquely rounded yellow Wocky that lay slumped on the examination table. He looked up at the commotion and instantly smiled. He shrugged. “The chain broke. Just a bit sore.” He seemed ignorant of his colossal weight, as if he felt inside like the same old, slender Edax that he had been the day before. “Yes,” Elisha said. “Yes, it is.” She walked to Edax and took his hand, which felt twice the size it had that morning. Edax slid off the bed, his fur sloshing around like a half-melted slushie on a summer afternoon, and as they walked into the hall, his new shirt bulged at the seams. Elisha poured the light dressing over their salad and then tossed it once or twice till all the greens were coated. The sun was beginning to set, and she was certainly beginning to feel hungry. With how uneasy she still felt after all the day’s events, she was surprised she had any appetite at all. Her mouth hung open and she gasped, face skewed in disgust and fear. The game cards and tokens were scattered across the floor, all the way up to her feet; the game board itself was upside down near the chair. And towering above all of it was Edax, large as a balloon, swollen almost as big as the entire sofa itself. Then with a splintering crack, the sofa’s legs shattered and the house shook as it crashed to the floor, the yellow Wocky still growing larger atop it. “Edax, what has—” But she couldn’t bring herself to say another word as her son continued to double in size, larger and larger, thicker and thicker, nearly as big as the entire room now. Elisha nodded and stepped up to her son. She cradled his head in her arms until his head was as big as her body and she had to slide back into the kitchen to keep from being crushed. Edax opened his mouth to say something, but his lips were pressed against the doorframe and no matter how much they wiggled, no words came from within them. Her son’s face, misshapen and obtuse, kept squirming and contorting as he tried to speak. The doorframe began to buckle outwards, cracks began rippling through the wall, and then Elisha screamed as it all shattered towards her. She spluttered for breath as the dust settled, waving her hands to clear the air as she caught a last glimpse of her son’s wriggling lips. His eyes drifted shut and Elisha’s heart stopped till she heard his raspy breaths continue blowing the air back and forth across her. The stress was far too much to bear. He’d fainted. The sun had set by the time the caravan came into sight. Lanterns hung from the rooftop while scattered torches lit the path. There was no one in sight. It was deserted. She swung her head left and right and back again, then saw her mark: the blue Usul from before. She had done this. “Good evening,” the Usul said as she approached. Elisha closed her eyes and sighed. She felt much better now. Elisha turned towards the voice as a stern-looking pink Aisha approached them. The Usul—Gindara, apparently—smiled weakly and looked to the ground, scratching her head. “No, no...” the Aisha said. “I’m... I’m just... just fine, thank you... I’ll... I’ll be alright.” Then she turned away and staggered into the night. Indeed, blood is thicker than water, and sugar draws more flies than salt.